In episode 39, Rosie and Jessica have been binging hard on web series, The Lizzie Bennet Diaries, while Rosie is working on some issues regarding book buying. Jessica has been eating large quantities of spaghetti and going to the theatre. In honour of the “great” British summertime, they bring you their Top 5 picnic foods and stories of a baking disaster. Jessica brought us Speechless by Lady Gaga, while Rosie went for The Pop Singer’s Fear of the Pollen Count by The Divine Comedy. It’s James Lance! He is appearing in Jeeves and Wooster in the West End until 2015. Please view The Lizzie Bennet Diaries responsibly. 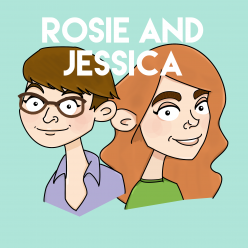 Rosie and Jessica discuss their favourite sandwiches in Episode 8: Hip Hop and Falafel. Zachary Levi and Bert encourage you to enjoy A Lovely Sunny Day. Rosie recommends Elis James and John Robins on Xfm and Judge John Hodgman. You can find Rosie and Jessica on Ravelry, where you can see updates on Jessica’s Ribbit Hooded Cardigan.